Unwind in the aromatic and relaxing atmosphere of Orientala Spa with a selection of treatments designed to rejuvenate and beautify. Known across the world for their healing properties, Thai massages are an affordable luxury and an experience not to be missed on your trip to Phuket. Indulge yourself with 1 to 2 hour massage sessions, from a traditional Thai massage to an oil massage or even a sports massage. Each treatment comes with its own benefits and will be a great way to refresh and catch a break from your active vacation. It is much cheaper to purchase the plan in KLOOK than official website. The quality of Thai massage is the same for paying full fare. The therapist is good and the environment is clean. You can communicate easily with the receptionist to indicate your preference. It is much cheaper to purchase the plan in KLOOK than official website. The quality of Thai massage is the same for paying full fare. The therapist is good and the environment is clean. You can communicate easily with the receptionist to indicate your preference. I love it !!! If we have more day in Phuket will definitely come here again . We were book Thai massage and oil aroma massage for 2 hours . And we didn’t expect much. But the masseur we well trained. The two sections we were all fall asleep that was too nice . I love it !!! If we have more day in Phuket will definitely come here again . We were book Thai massage and oil aroma massage for 2 hours . And we didn’t expect much. But the masseur we well trained. The two sections we were all fall asleep that was too nice . The Best. We were late by almost one hour due to some reasons, still they held the bookings for us. The representatives were extremely professional and courteous. They accommodated us in the next available slot managing other scheduled bookings. The massage was equally good. Recommended for everyone. The Best. We were late by almost one hour due to some reasons, still they held the bookings for us. The representatives were extremely professional and courteous. They accommodated us in the next available slot managing other scheduled bookings. The massage was equally good. Recommended for everyone. Tried 3 spas from Klook in Phuket and this was the best! Good therapists. Tried 3 spas from Klook in Phuket and this was the best! Good therapists. I have signed up aromatherapy and hot herbal compress.. It is one of the best spa i have done.. Before start, there are four different aroma for me to choose & the therapist did the good jobs, massage it very well. I have signed up aromatherapy and hot herbal compress.. It is one of the best spa i have done.. Before start, there are four different aroma for me to choose & the therapist did the good jobs, massage it very well. It’s very relaxing! And the price is very cheap! Recommend It to all of you! It’s very relaxing! And the price is very cheap! Recommend It to all of you! I had a 2-hour Thai massage, the masseur was great and the environment/ambience was very relaxing, every staff who walked by was friendly with a smile on their face, except for a few noisy tourists, the overall experience had really none to complain about. Perhaps the receptionist can be a little more friendly. 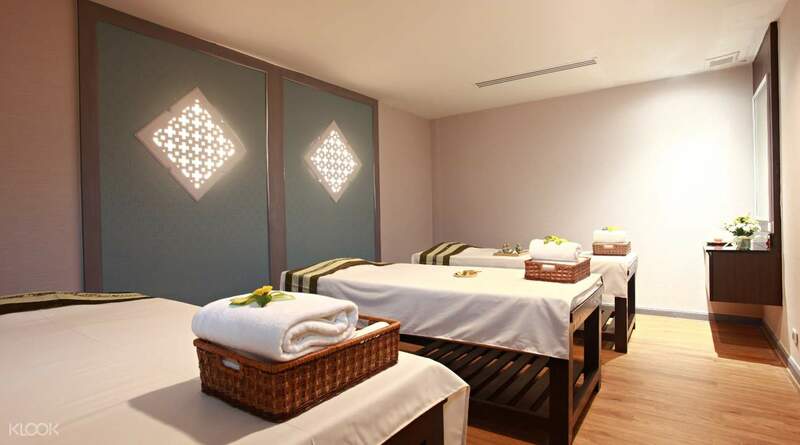 I had a 2-hour Thai massage, the masseur was great and the environment/ambience was very relaxing, every staff who walked by was friendly with a smile on their face, except for a few noisy tourists, the overall experience had really none to complain about. Perhaps the receptionist can be a little more friendly.